This dish is easy to cook. It also cooks quickly. You should be able to enjoy your homemade pancit in around 30 minutes. Start by preparing the vegetables. Stir fry a portion of the sliced onion along with carrots, snap peas, and cabbage for 1 to 2 minutes. This partially cooks the veggies. Set it aside. These will be added back in the last steps of the process. Cook the pancit by sautéing garlic and onion in a cooking pot. A deep pot is ideal for this dish so that you can toss and mix the ingredients easily. The pork and Chinese sausage need to be cooked first. Add these into the pot and saute until pork turns brown. Add the squid balls next. Filipino pancit dishes often use soy sauce as the main seasoning. 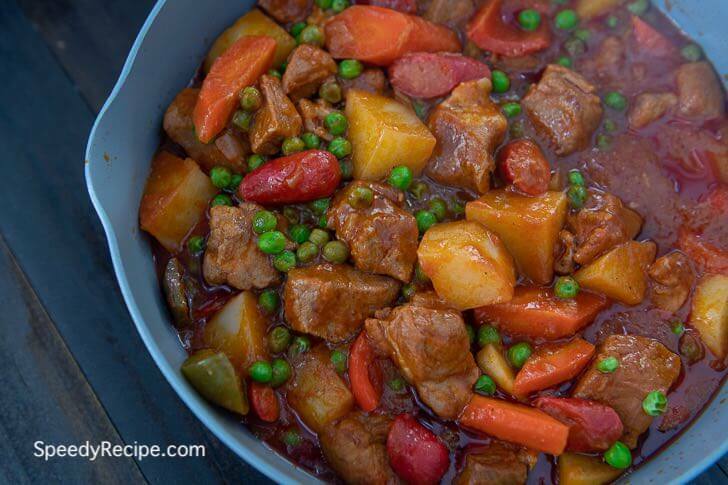 However, I think that it is always best to incorporate meaty flavors into the dish to make it taste better. For this reason, I am using both soy sauce and chicken broth. Add these ingredients along with chopped parsley. and let boil. I strongly suggest adding the parsley at this stage. It makes a huge difference in terms of overall flavor of the dish. Continue to cook for 5 minutes or until pork gets tender. Add the flour noodles. These are also called pancit canton, just like how the dish is named. I cover the pot at this step so that the noodles can absorb the steam quickly. This makes it softer and easier to toss. Toss the noodles and add the stir-fried veggies. Season with ground black pepper and salt if needed. You may also add more soy sauce. Pancit is best eaten with calamansi. It is a small citrus fruit. It is also referred to as calamondin internationally. Squeeze a piece of calamansi over your pancit canton and toss before eating. Enjoy! Flour noodles cooked with squid balls and pork and tossed with a variety of vegetables. This delicious Filipino dish is worth your trying. Heat 2 tablespoons of oil in a pan. Stir-fry half of the onion, carrot, snap peas, and cabbage for 2 minutes. Remove from the pan and set aside. Add pork and Chinese sausage. Saute for 3 minutes. Add squid balls. Continue to saute for 1 minute. Pour soy sauce and chicken broth into the pot. Let boil. Add chopped parsley. Cover and boil for 5 minutes. Put the flour sticks into the pot. Cover and cook for 1 minute. Toss until all ingredients are well blended. Add stir-fried vegetables. Toss. Continue to cook between low to medium heat until the noodles are completely done.